Johnny Depp. Kate Winslet. Julie Christie. Radha Mitchell. Dustin Hoffman. Freddie Highmore. Joe Prospero. Nick Roud. Ian Hart. Kelly Macdonald. Drama. True Stories. 01 Ade tastics. 1900-1919. 01 Nigel's Choice. 01 Dave B's must sees. Weepie / Tear Jerker. Lulu Loves .... Family Viewing. Biopic. Recommended. Rob Recommends. Peoples' Choice. James M Barrie is a lonely man, in a failing marriage, and a playwright whose work has seen better days. When Barrie meets a group of children in the park he finds himself enchanted, and it is not long before he has settled deep within the bosom of their family life, a loving matriarchy held together by the children's young widowed mother. 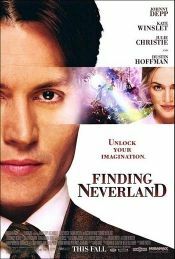 Finding Neverland is based on the play by Allan Knee, and is a tender, deeply moving interpretation of Barrie's inspiration for "Peter Pan". Beautifully performed, beautifully visualised, it's an enchanting and �grown man blubbing' tour de force.